Clockwise from top left: Carol Stoudt, Jamie Queli, Nancy Rigberg and George Hummel, Gina Vasoli, Rosemarie Certo and Christina Burris. Women drinking, selling and brewing beer is nothing new. Not only was homebrewing primarily a domestic chore until the 15th century, but women have been a driving force behind the craft beer boom since it began in the 1980s, and organizations like the Pink Boots Society are promoting even more female involvement in the industry. But while beer gets a lot of attention in a city like Philadelphia, where a dozen or so breweries are within easy reach for enthusiasts, its female pioneers can get overlooked. 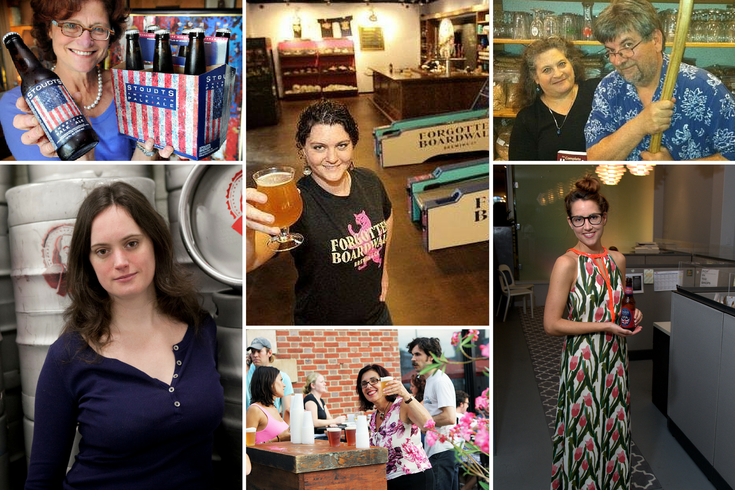 Luckily, Philly is home to a unique set of women working in an industry they love and spreading the gospel of beer to a new generation. (It appears to be working: Women between the ages of 21 and 34 are buying 15 percent of craft beer by volume.) Meet the local ladies paving the way through a male-dominated industry for the beer lovers of the future. 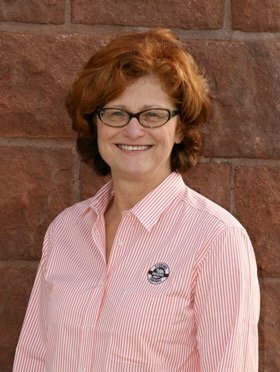 In 1987, Carol Stoudt opened up Stoudt's Brewing Company in Adamstown, becoming the first female brewmaster in the country since Prohibition. Dubbed the Queen of Hops by her peers, Stoudt began the brewery when she and husband Ed realized they could support their family restaurant and fill a local hole by brewing their own beer. Due to a state law that (at the time) prohibited Pennsylvanians from owning both a brewery and a restaurant, Carol took the lead. Over the years, Stoudt has seen a world of change come over the industry, including an influx of women. Though she never experienced it herself, at times, the male-dominated dynamic meant discrimination or sexual harassment for incoming female peers. 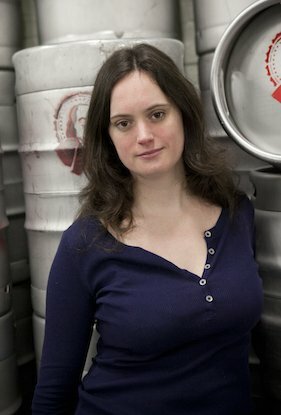 Now, she encourages breweries to adopt protective policies to promote women joining the business, in hopes these stories will cease to exist. Of course, the biggest change Stoudt has seen in her three decades in beer is the product itself. "When I started, no one knew what the word 'craft' was," she said. "No one knew what fresh beer was. They didn't know about hops or malt. Beer was basically what brand you were drinking." Now, craft beer drinkers make up 11 percent of the beer industry by volume (up from 5 percent in 2010), and homebrewers are taking the same leap that Stoudt made 30 years ago. "It's really kind of humbling to think that a group of people that were so passionate about beer kind of started this whole revolution," she said. Rosemarie Certo and her brand, Dock Street Brewery, started in 1985. Coming from a Sicilian family that produced wine and olive oil, Certo grew up making things with her hands. Thus, homebrewing was a natural past time for Certo in the early 1980s, just ahead of the craft boom. She and then-partner and wine seller Jeffrey Ware first began selling their brews in 1985 before opening a brewpub in Logan Square in 1989. The pair sold the company in 1998, but Certo bought it back in 2002 and reopened the brewpub, this time in Cedar Park, its current location. She's been running the place for 13 years now and expanded the brand by following another passion and founding Dock Street Spirits in 2013. Despite her status as a pioneer for women in beer, Certo said she still sees a dearth of female power in the business. Noting the subtle ways discrimination may show itself in any industry, she said it may have been easier to become a female brewer before the craft boom, "when being a craft brewer was as different as being a woman in the brewing industry." Though she hopes more women will come out of the marketing department and onto the brewery floor, being a trailblazer suits Certo just fine. "Who wants to navigate a road that everyone else has?" she said. "I like to go down the roads that are different." Anyone who frequents Home Sweet Homebrew in Center City knows two things about the brewing supplier: The two shop cats, Jake and Elwood, are the friendliest you'll ever meet, and owners Nancy Rigberg and George Hummel (left) are even friendlier. The pair took over the business in 1990 and have been supporting Philly's blooming brewers ever since. In her 25 years in the shop, Rigberg has seen many a frequent shopper turn their hobby into a business, like Christina Burris of St. Benjamin Brewing Company (below). Watching Philly generate so many small, neighborhood breweries has been particularly gratifying for Rigberg. "We've been supporting [brewers] for so long, I feel like everybody's Mother Brewer," Rigberg said with a laugh. "It's all about inspiring confidence in people." Rigberg, who also leads the popular Ladies Beer Tea each year during Philly Beer Week, is happy to see more women walking in her doors each day, too. She said that, like with many STEM fields, young women just need extra encouragement to get into a traditionally male industry like brewing. "Get girls interested in the sciences and you'll see more women in the brewery," she said. Nanobrewery St. Benjamin Brewing Company is the brainchild of Christina Burris and Tim Patton, two friends with a shared passion. Each was working on their own startup brewery before they teamed up in 2013 and the Kensington-based brewery was born. Though Burris says that her experience as a woman in the industry has been largely positive, she does acknowledge that she is sometimes the recipient of gender-based assumptions. For instance, many people assume she and Patton are romantically involved (they're not) and that Burris is helping Patton fulfill his dreams of being a brewer. "I find it belittling that people don’t believe I have my own dreams," she said. "...[But] it doesn’t stop what I can do in the field. I’m really good at what I do." 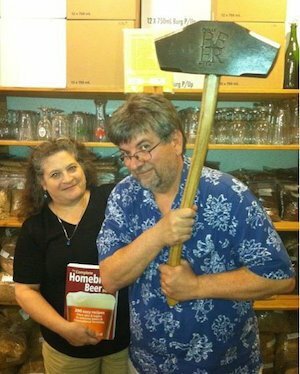 The past year - and the many long nights and days a labor of love requires - has galvanized Burris' advice to anyone interested in owning a brewery: Homebrewing is great, but working in a brewery is where you learn the most. Like Burris, you have to be dedicated and strong. "I’m in it for the long haul, and I’m doing it because I wanted to build a long-lasting business in Philadelphia that can grow and interact with the community." Like Christina Burris, Jamie Queli turned her love of beer into a hobby by brewing at home. After a career in investment banking, Queli had the know-how to start a business but wasn't in a line of work she felt passionate about. In October 2014, she opened Forgotten Boardwalk Brewing Company, finally matching her passion to her skill set. 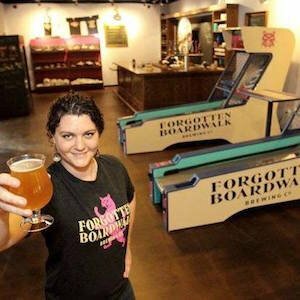 Her Cherry Hill tasting room is boardwalk-themed and is filled with Skee-Ball games and fun house mirrors. The brand's mascot is a three-eyed cat name Growler, an homage to the stray cats that live under the New Jersey boardwalk where she grew up. One might wonder why such a beach-happy brewer would set up shop inland, but Queli wanted her brewery close to the action of Philly and South Jersey's beer scenes. As one of few female brewery owners, and a young one at 30 years old, Queli admits she did face a little trepidation from her peers when opening Forgotten Boardwalk. "When I first opened up, I definitely felt a lot of resistance from my fellow brewers - but I’m not sure if it was because of my gender or my age or just new competition," Queli said. Despite those moments, Queli doesn't see the beer industry as more difficult for women than any other industry. "I think [women] like to call the shots," she said. "...When [the industry] does appeal to women, we do make the plunge." Though Gina Vasoli was always a casual beer fan, she ended up at Yards Brewing Company because she was a bigger fan of their company values. Only after becoming their deputy of art & marketing did she get really interested in craft beer. Eventually, realizing that a social beer club for women was sorely lacking in Philadelphia, she and Yards sales rep Kristin Caine decided to start one of their own. 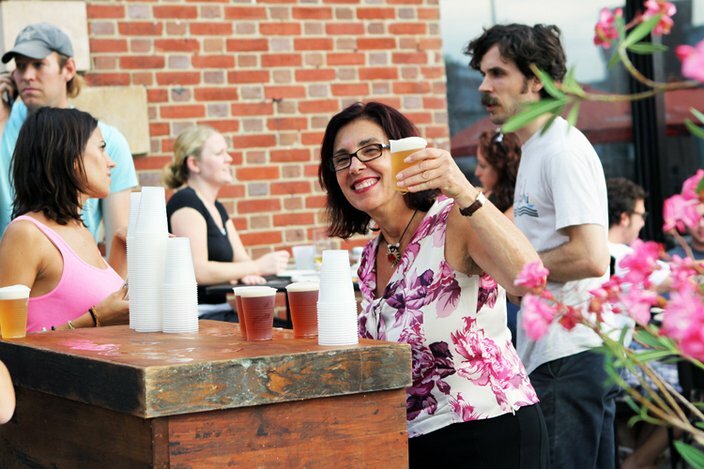 The Lady Birds Beer Club, a monthly group for women who love good beer, was born. The pair didn't go crazy promoting their inaugural event, just sending out a few messages through the Yards social network, and yet 75 women showed up to the April 1 meeting. Needless to say, it wasn't what Vasoli had expected. "I think it’s a testament to the need and the interest level for something like this in Philadelphia that we got such a great response," Vasoli said. So far they've held three meetings, and activities have included everything from get-to-know-you icebreakers to a lesson on the history of craft beer. Their next meeting on July 1 will be Independence Day-themed, taking place at the Betsy Ross House and including a no-sew hemming workshop. Though she's always felt welcome at Yards, Vasoli said it is exciting to be part of a female minority that only continues to grow, both professionally and personally. "My exposure through the Lady Birds gives me the perception that interest is growing, and not just amateur interest, but real love for craft beer and knowledge of the whole world on a deeper level," Vasoli said.